I'm not a fan of architectural minimalism. To me its modern architecture stripped of it's original social idealism. Minimalism is just another "style" which always turns out to be deceptively expensive. Late last month, my friend Peter Davis held a seminar at his home. One of his guest speakers was another long-time colleague, Yogen, who showed his work as an agricultural contractor. Among other things, he builds really cheap animal housing using minimal structure. And Yogen has also developed and implemented a very cost effective cooling system for the buildings. Contrast this with this "Agro-Housing" proposal for Wuhan in China. 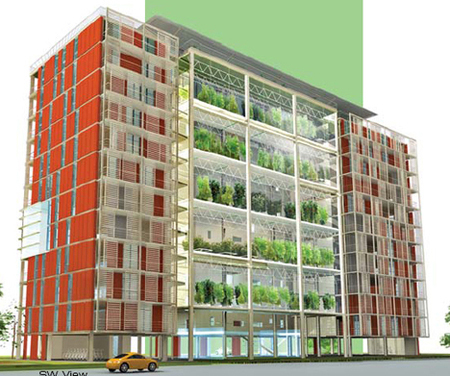 Here housing and high-tech farming is fit together in a high-rise structure. No way is this going to be economically feasible. Tack on the buzz-word "sustainable", and that seems enough to justify the craziest sorts of ideas.